Every month, artist Larry Caveney throws open the door of his garage and reveals … an art gallery displaying a carefully curated theme show. 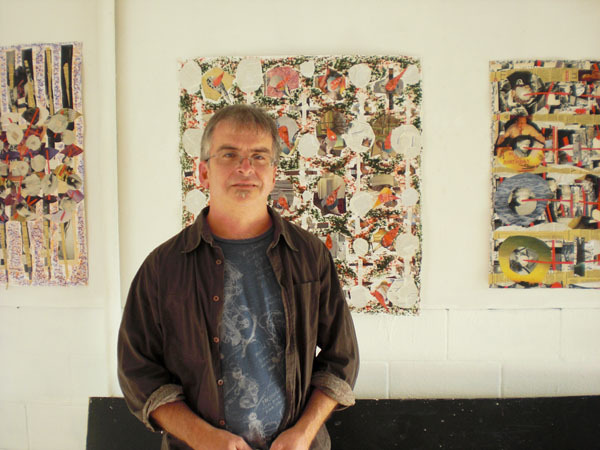 In this interview from the September 2010 Zenger's Newsmagazine, he talks about his history of exploring non-traditional art spaces and the way The Garage helps him and the other artists he shows reach an audience in a comfortable non-commercial venue. Talk About Your Non-Traditional Art Spaces! At least one afternoon and early evening a month — usually the third Saturday, though it varies — an ordinary garage door at 4141 Alabama Street in North Park opens up and becomes an art gallery. The proprietor, Larry Caveney, even calls the space “The Garage,” which may lead some art lovers who see the posters advertising his shows to think it’s just a cool name for a normal gallery instead of … a garage, albeit a clean one with paint specks instead of grease stains on the floor (Caveney also uses it as a studio to create his own works) and whitewashed walls to showcase the works Caveney hangs in it. Caveney’s work ranges from relatively traditional paintings and collages — many of the latter using elements from art-show catalogues (he likes to incorporate other artists’ works into his own) — to “interventionist” or “situational” work. According to Caveney, situationalism is a movement launched in the 1960’s by French artist, theorist and Marxist activist Guy Debord, who wrote an influential book in 1967 called Society of the Spectacle. Caveney read Society of the Spectacle and “it started making me think about public space.” Specifically, it provoked him to challenge the distinction between public and private spaces, and the ongoing tension in spaces like shopping malls that are “public” in the sense that people are welcome to them but “private” in their ownership and the desire of their owners to see that people don’t do anything there but shop. Drawing on the examples and ideas of Debord and German performance artist Joseph Beuys, Caveney said, “I go to the Department of Motor Vehicles and build a little stage where I can dance into a painting, and people coming out of the DMV can make marks on the painting. The idea is to make that a collective space that’s an outlet for people” — not merely somewhere people go to get their drivers’ licenses renewed. He also said he works on “paintings on clothing” — not the sort of “wearable art” people usually think of when they hear the words “painting” and “clothing” in the same sentence, but works in which old clothes are shredded, rearranged and used as raw material for the artist. Unlike some non-traditional art exhibits which merely open a space and let artists throw things on the wall willy-nilly, Caveney carefully curates his shows at The Garage, selecting both the artists and the works to reflect a particular theme. For his August 2010 show, “Becoming the Animal,” he put out a call to local artists working on pieces that explored the connection between humans and animals, including works that metaphorically dealt with evolution. Not all the Garage shows are themed, Caveney said, and not all of them are multi-artist; he’s done one-person shows too. “We might have a local artist who wants to experiment with the space, and they can jump in with an installation,” he explained. The shows he has scheduled for September and October illustrate both types. The September 18 show is called “Songs of Flesh and Blood,” which Caveney said is “all about the body as cultural identity, internal and external.” In October — he hasn’t set the exact date yet — he’ll be presenting a one-woman show with artist Barbara Goldsand of the Art Meets Fashion group (http://www.artmeetsfashion.org),who has an interesting pair of professions: artist and registered nurse. One thing The Garage isn’t is a moneymaker, Caveney readily admitted. Though some of the artists who exhibit at The Garage have actually sold works from it, “that’s not an objective, and it doesn’t make that big a difference,” Caveney said. “This is not a commercial model; it’s an extension of my own creative work. We want to experiment with the space and explore some ideas.” He’s already got The Garage booked until the end of 2011 — though he concedes that his mortgage is “upside down” and he might lose the space along with the condo he and his wife Karen live in above it — and though he usually runs his shows in the early evening (6 to 9 p.m. or 7 to 10 p.m.), he might experiment with earlier hours, like 11 a.m. to 5 p.m. to see if that creates “a more leisurely experience” than a formal art opening. According to Caveney, The Garage “has its own life” because it meets a need artists, like other creative people, have to reach an audience. Though most of the people who visit are either his friends or people who’ve been attracted by the posters he puts up throughout North Park and Hillcrest, he’ll also call out to neighbors and others just walking by and ask them to come over and look at the work. “It’s innate for all of us to want to show what we’re doing,” Caveney said — and for him The Garage is an elegantly simple way for him and other artists to do just that.